T, Arnwine, and I headed down to the Guilford Skatepark last night for a late afternoon/early evening session. We were surprised to see at least 10 skaters at the park, it is typically a ghost town. A few MTB riding locals I chat with on PinkBike.com showed up and were getting rad. Pete Krol, Schmidt, his girlfriend, and their dog showed up later in the evening. After the skaters cleared out around 7:45 we ended up having a really fun session. We were able to bomb around the park, Schmidt let his dog Lager loose and he was running up and down the ramps, and we rode until it was pitch black around 9:00. I must admit, Pete Krol impressed me! 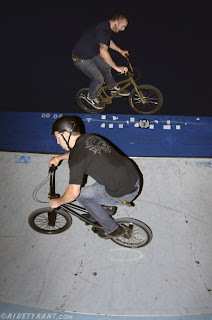 I don't know how much he has been riding his BMX bike, but Pete looked really comfy on it last night and was getting some decent air and flowing the park well. Bry was trying a good size fufanu, Schmidt was boosting the big quarter, T was clearing the box jump with ease, and all in all we had a good time!